Wedding Venue, Banquet & Restaurants Show 2012 will be held from 27 April – 1 May 2012 in Hall 1 & 2 Mid Valley Exhibition Centre, Kuala Lumpur. WVB&RS – More than 65 Hotels & Restaurants from KL and PJ to choose from. Plan your dream wedding venue / wedding dinner within your budget or in the most luxurious 5-star setting banquets! – See below for the list of Hotels & Restaurants (Exhibitors). Still have no idea where to held your wedding dinner? No clue on date availability and menu packages? Hassle-free and convenient – Come to one location (Mid Valley) and find out more on different wedding dinner packages offered by more than 65 locations throughout Kuala Lumpur, Petaling Jaya, Puchong, Subang, Klang and more. 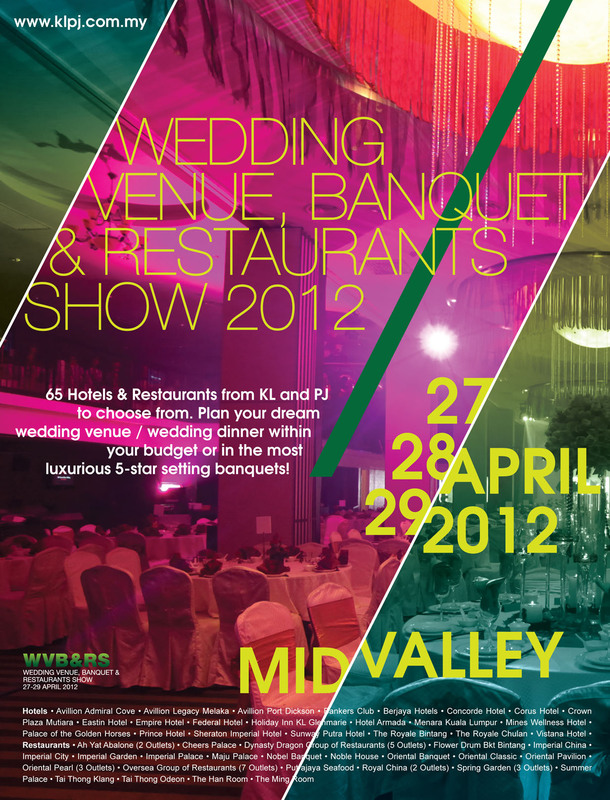 Wedding Venue, Banquet & Restaurants Show (WVB&RS) is one unique show incorporated in 4th KL-PJ Wedding Fair 2012. Couples can source for all your wedding needs everything under one roof, featuring KL-PJ Top 35 Local Bridal Houses. Visit http://www.klpj.com.my to view all hotel & restaurants profile and ballroom images.